In 1921 Lenin surprised foreign observers and many in his own Party, by calling for the legalization of private trade and manufacturing. Within a matter of months, this New Economic Policy (NEP) spawned many thousands of private entrepreneurs, dubbed Nepmen. 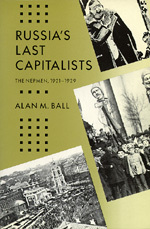 After delineating this political background, Alan Ball turns his attention to the Nepmen themselves, examining where they came from, how they fared in competition with the socialist sector of the economy, their importance in the Soviet economy, and the consequences of their "liquidation" at the end of the 1920s. Alan Ball's history of this experiment with capitalism is strikingly relevant to current efforts toward economic reform in the USSR. Alan M. Ball is Associate Professor of History at Marquette University.